The year that is nearly over was not my finest. I ran 390.97 miles, running on 106 occasions, and ascending 7,578 m. For comparison, in 2013 I covered 406.05 miles in 113 sessions, and in 2012 687.33 miles in 161 runs. Some months were better than others; in the early part of the year I was still beset by a knee injury. From the chart below you’ll see that the first half of the year, and October, for some reason, were the worst months. As for races, I entered nothing until the Heathfield 10k in late June. After that, I began to find form once more, and even improved on my 2013 times for some races. What of 2015? I already have a place in the Hastings Half, and training is in progress; indeed, yesterday I ran my first interval session for a very long time. 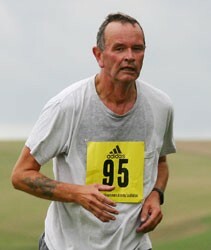 I’m tempted by other, longer races too: the Rye Ten Mile and the Bewl Fifteen for example. I’m more interested in new races than those I’ve run before. I have no plans for another marathon, though perhaps I should. I reach the ripe old age of sixty in February, though runners, like racehorses, all have their birthdays at the same time of year so I will not go up into the 60-70 age group until 2016. The sun shone as I drove north through Sussex to the start. Crowborough is famous, not only as the home of Sir Arthur Conan-Doyle, but also as the highest inhabited point about sea level in East Sussex. I found the race headquarters in damp thick fog. The race is hilly, two laps, comprising a long descent, an ascent and a brief flat stretch. It is easy to go too fast on the first downhill, as I did. The uphill starts with a ford, and it is a mark of pride for many to run through it. I did so on both laps. So, while today’s time was not a course personal best, it represents improvement. It would be lovely to run it inside the hour. Perhaps it is still possible.